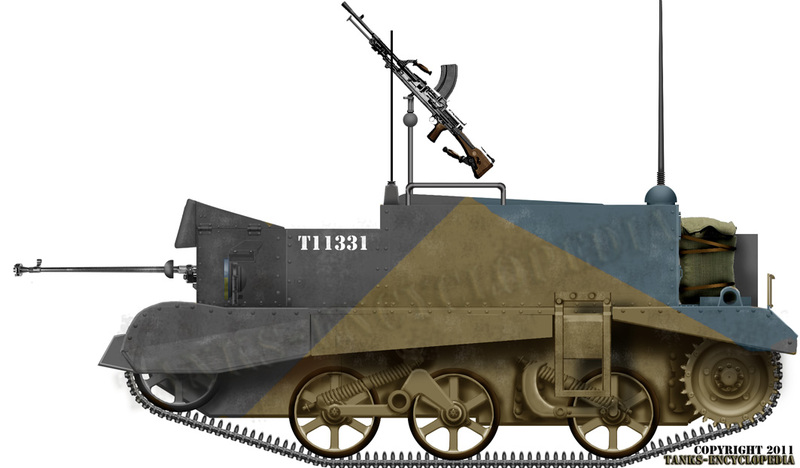 The early Carden-Lloyd tankettes from 1933 were the very basis for the Universal Carrier. Originally, these machines were invented by Major Giffard LeQuesne Martel, who developed a prototype privately, for potential requests from the Royal Army Corp. He was a military engineer and a daring tank strategist. After his demonstration to the War Office, the Carden Loyd Tractors Ltd. company was requested to study practical production. They introduced a slightly enlarged vehicle for two men. Success with the prototype guaranteed their first order, with Vickers-Armstrong’s business network as a backup for exports. The last production version was the Mk.VI, of which up to 450 were built in all, from 1927 to 1935. The Mk.VI was the blueprint for the Universal Carrier. 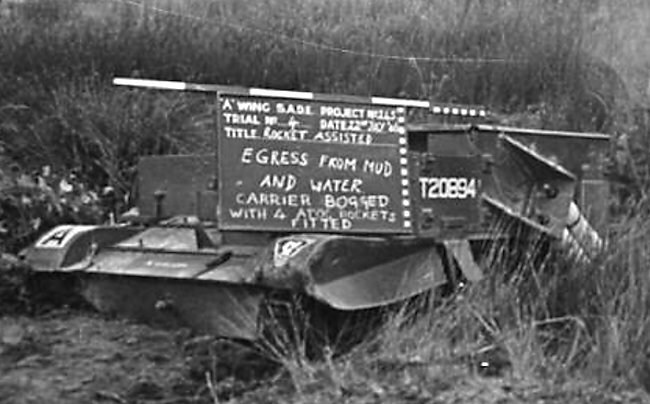 A hundred or more of Mk.VI tankettes were sold abroad. 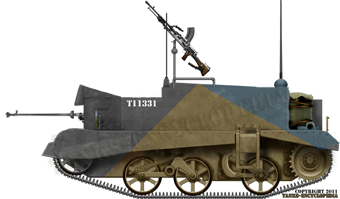 The Mk.VIs in service with the British army were scouts, transports, machine-gun carriers, artillery carriers, mortar carriers and smoke projector carriers. Later on, experience showed that a single model was preferable to six or more, and a larger one was conceived by Vickers and approved in 1935 for mass production as the “Medium Machine Gun Carrier”, “Bren Gun Carrier”, “Scout Carrier”, and “Cavalry Carrier”. Compared to the previous Carden-Loyd Mk.VI tankettes, they were enlarged, with the crew now at the front, driver and machine-gunner, and a large open gallery with a rounded end for all kind of loads. Up to five infantrymen or a gun crew could be deployed quickly. The suspension was a mix of the standard Vickers type and Hortsmann springs. Production was assumed by Aveling and Porter, Bedford Vehicles (British Ford), Morris, the Sentinel Wagon Works, and Thornycroft. But the real production of the definitive standard “Universal Carrier” and first deliveries (Mk.II) came in 1940, just in time for the campaign of France. 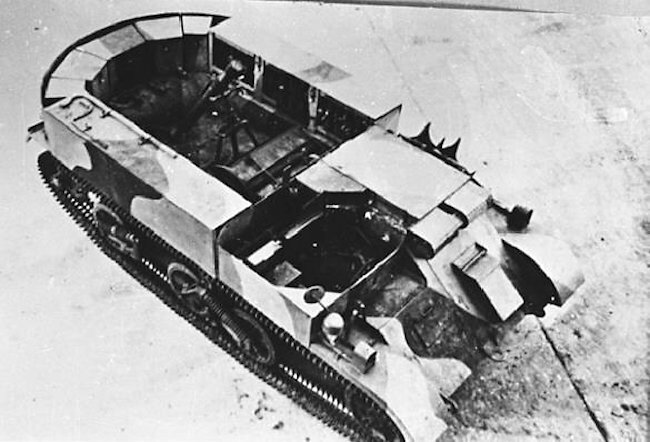 The Mk.II tankettes were the production version of the many “Carriers” which were built from 1935 to 1940. This standard version had a square gallery and was versatile enough to accommodate all kind of military payloads easily. They were always equipped with a towing device. The Mk.II was the most heavily produced, from 1940 to 1945, in Great Britain, in the Commonwealth and Canada under various licenses. Their speed and agility, but most of all, tremendous versatility, became legendary, despite their lack of armor and weaponry. Infantry battalions were given 10 to 33 of these from 1940 to 1943 and motorized artillery battalions were entirely equipped with these vehicles, each carrying an ordinance antitank QF 6pdr (2.24 in/57 mm) gun. This was an American-built version, derived from those manufactured by Ford-motor Canada. They were sent to Great Britain and the Commonwealth under Lend-Lease. Up to 16,000 units were built with local modifications and improvements, starting in 1943. Many were rearmed with a heavy Browning cal.50 (12.7 mm) machine-guns. Most of them were used by the Canadians as artillery tractors in Europe. After the war, surviving units were sold to Switzerland and the Low Countries. There was a heavy machine gun version equipped with the .303 (7.7 mm) Vickers machine-gun, also replacing the forward Bren gun. There was also a flame-thrower version, where a pipe exhaust replaced the Bren, called the Wasp, and carrying the “Ronson Flamethrower, Transportable, No 2”. The Canadian-built ones were named Wasp Mk.IIC. A gun version was developed especially for the Homeguards, armed with a Smith 8pdr mounted in a large sponson at the front. A prototype of the strange “Praying Mantis” was also built and tested in 1943. 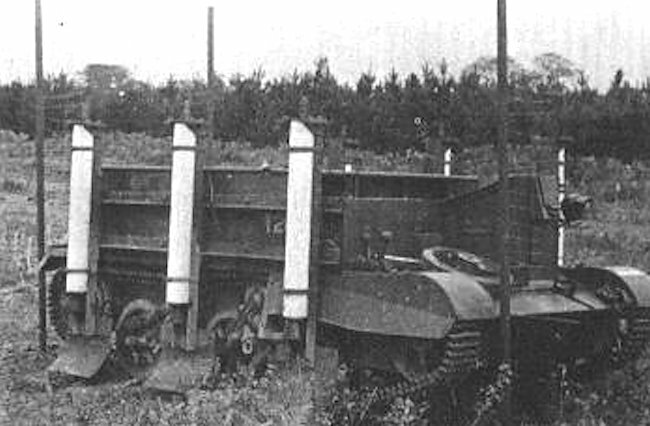 This very low-profile vehicle was designed to fire from above walls or hedgerows. Australia built, under license, no less than 5600 LP1 and LP2 versions, essentially some slightly modified Mk.I and Mk.II. The LP2 was also produced in limited numbers (520 units) by New Zealand. 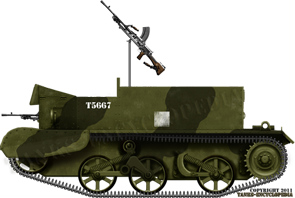 An antitank version, the Carrier, Tank Attack 2-pdr (40 mm/1.58 in) was produced (200 units), and a mortar-version, with the 3-in (76.2 mm) mortar. The QF 2 pdr (40 mm/1.58 in) was fast and efficient, but its mounting required the displacement of the engine to the front. Most of them were used for training. The 400 mortar versions were sent as military aid to the Nationalist Chinese. A few of them were captured in Norway, but most of the Mk.Is, later used by the Wehrmacht, were captured at Dunkirk in June 1940. Other various models were captured in Crete and during Rommel’s offensives in North Africa. German versions were dubbed “Fahrgestell Bren”. There were many derivatives, but most were rearmed with an MG 34 or 42 instead of the Bren gun, in a standardization effort. Some antitank Boys rifle versions, called Fahrgestell Bren 731 (e), saw extensive service in the Afrikakorps, but later received, in Sicily and Italy, more efficient antitank armaments, like the 3.7 cm (1.47 in) Pak (sometimes the hull was covered with spare wooden protections), or Panzerschreck and Panzerfaust (mostly in 1944). Another version, seen around airfields and gun positions was largely used by the end of 1944, the Fahrgestell Bren 731(e) Flak 38, with a 20 mm (0.79 in) QF anti aircraft mount. 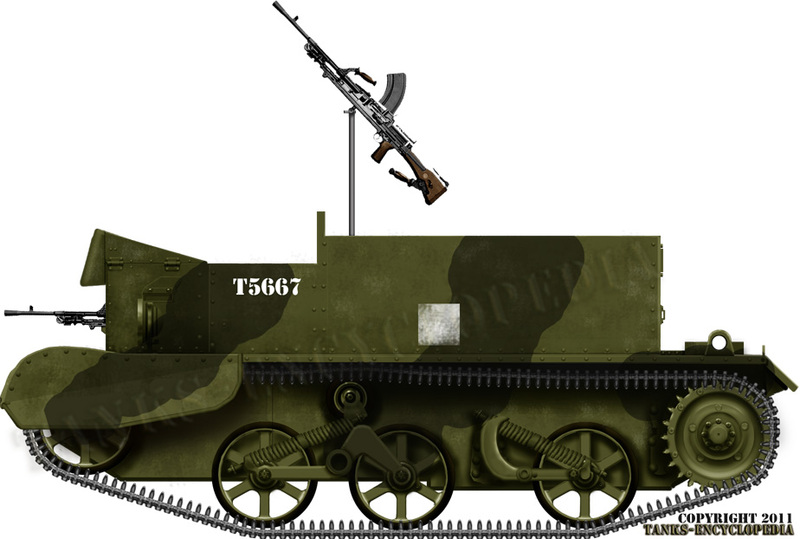 The versatile and cheap Bren Carrier benefited from such a large production that many Allied countries were equipped with it. Exiled country armies were often equipped with it, like the Belgian, Dutch, Danish, Polish, Czechoslovakian, Norwegian, Greek and the French free forces. They received large amounts of Bren Carriers for various duties. Before the USA provided enough vehicle to make a surplus (1943), the Bren Carrier was seen everywhere, under all flags. This dependable machine had another advantage. Being so light and relatively small, it could be carried like a Jeep in gliders. Many were used by commandos and paratroopers. 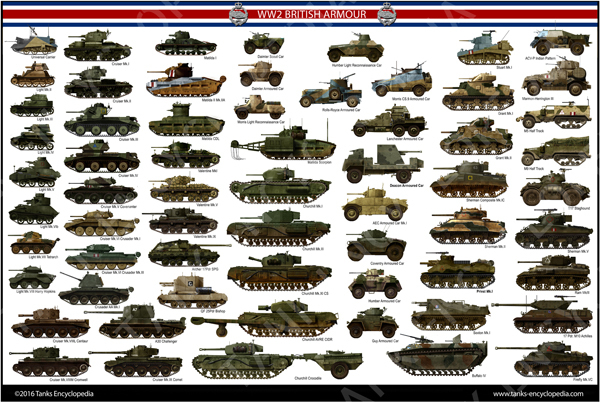 Around 81,700 vehicles were built during the war in all. 31,300 were produced after the armistice. The concept was very successful, in Great Britain, but also in many other countries like the Swiss Confederation, Netherlands (mostly modernized T16s), but also Belgium. The Belgians produced a specific model, the CATI 90, for “Canon antitank d’infanterie automoteur 90mm”, serving in infantry units paired with a 90 mm (3.54 in) autocannon. The last of these left the Liege factory in 1964. Some were still in service for training as far as 1984. A camouflaged 1942 Mk.I “Bren Carrier”, here with an added anti-aerial Bren on the specially modified mount. Click for the high definition illustration. A Universal Carrier Mk.II heavily modified for desert combat with the VIIIth army, El Alamein, June 1942. This version was capable of towing artillery like the ordinance QF 6pdr (2.24 in/57 mm). 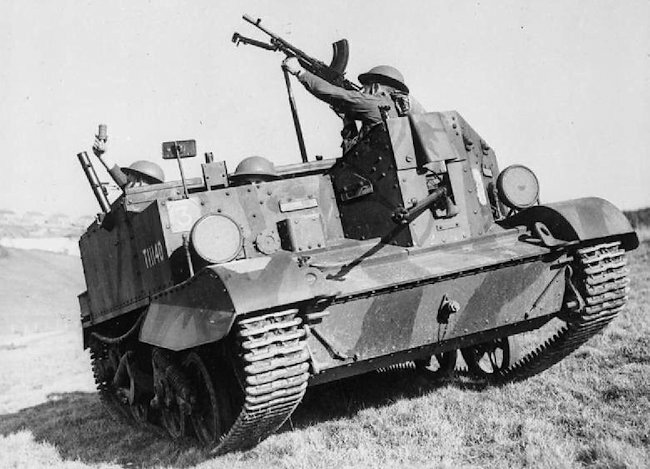 However, this vehicle was equipped with a long range radio for scouting, an anti-air Bren gun and, instead of the regular forward mount, a 13.9 mm (0.55 in) Boys anti-tank rifle. 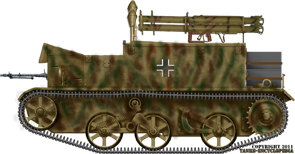 This added some anti-armor capacity, mostly against early Panzer II and III tanks and all Italian models, especially at short range, or from the rear. An Australian LP1 Carrier in North Africa, 1942. Some of the LP1s and LP2s were used in North Africa, were their speed, sturdiness and adaptability were true assets in the desert. Others were affected to ANZAC battalions fighting from New Guinea to the Solomons. An Australian-built LP2 Carrier converted as a “Vickers Carrier”, with a heavy Vickers cal.303 (7.62 mm) machine gun instead of the usual Bren. The Vickers machine-gun was relatively outdated but could still sustain long, punishing fire as well as endure harsh conditions, even in North Africa. The secondary Bren is mounted on a telescopic arm, here retracted. Canadian Wasp Mk.IIC. The British version of this well-produced (1000 units) flame-thrower variant, the Mk.I, was different. 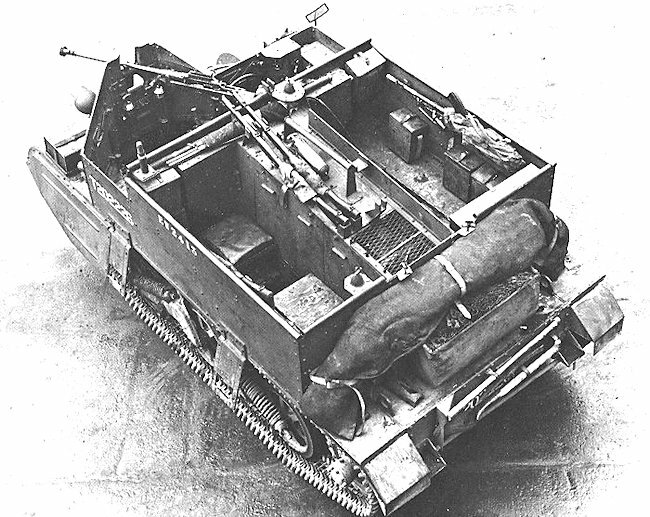 The Bren emplacement was replaced by the orientable projector, relatively similar to the portable infantry model, fed by two 50 gallons fuel containers at the rear, inside the protective hull. The Canadian version was called Mk.IIC, and the 75 gallons container was external, allowing an extra crew member to be carried. These models were widely used during from 1943 to 1945. A German captured Carrier Mk.I (Fahrgestell Bren), here converted into a “Panzerjäger”, or tank hunter. In fact, this was a far more convincing conversion than the usual Bren 731 (e) equipped with the original Boys rifle. In this configuration, there were three Panzerschrecks (Raketen Panzerbüchse 43) arranged on a centerline triple mount, with many spare rockets, and also six Panzerfausts. Italy, summer 1944. A Bren Mk.II mortar carrier at Bovington, where most of the Brens in the world are displayed – Credits: Wikipedia. An Australian Mk.I derived 3-in (76.2 mm) Mortar Carrier. 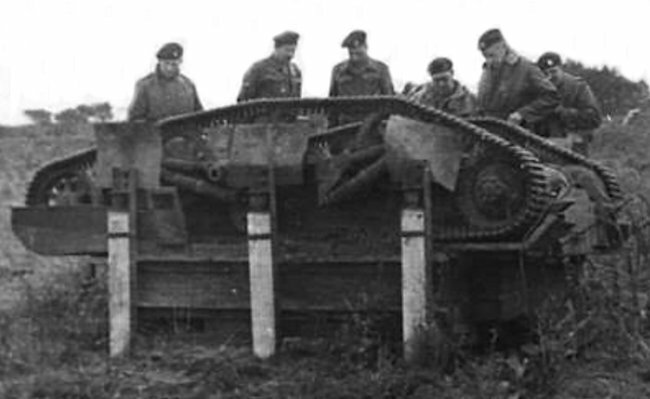 The rounded backside of the Mk.I is clearly visible – Credits: Wikipedia. A rocket powered gap leaping Bren Gun carrier prototype was also built. It was designed to cross minefields and other obstacles by firing its rockets. It got cancelled after it kept landing upside down during trials. Because of this SADE experiment and the fact that a jet engine was fitted to the back of a Valentine tank, the Valentine Gap Jumping Tank myth evolved. The Valentine SADE rocket experiment was, in fact, a mine-clearing experiment using the blast from a jet engine to detonate anti-tank and anti-personnel mines. Another SADE trial involved four rockets, two strapped together each side of a Universal Carrier. They could be set at an angle. The idea was that they would be used to help extract a vehicle that had become ditched, stuck in the mud or waterlogged ground. It was not successful. I was curious if all carriers used a V8? I think I have seen engine pictures of another version which show what appears to be a V6 “flathead”. Either way, I enjoyed your site. Now this article is fairly old, unlike the date shown (probably 2011) it seriously needs to be beefed up and new illustrations added. After all with a production of over 100,000 its deserves it. So this matter will be settled in the process soon or later. I’ve got a pigeon hole set which I’ve been told came from a bren carrier.. I’d like to know if it is genuine. It has a lot of interest.. Thank you. Your picture of a T-16 is off, as T-16s all sported an extra set of road wheels as per the picture in the link. They also sport a beefed up drive train and the steering is done by 4 tiller bars as opposed to the Steering wheel that is one the Mk1s and Mk2 UCs. Overall it had a number of difference as it was a unique design and exclusively produced in the U.S. Being Canadian, I can also speak to our contribution for Carrier production. Canada produced almost 30,000 carriers both Mark 1s (which were built up the end of 1942) and Mark 2s, including specialized models such as 3 inch Mortar Carriers, 2 pounder anti tank and the WASP flame thrower version that you mention. Indeed this post is fairly old (dates back to the first days of the website), and it has always been scheduled for a full-blown rewriting and massive expansion (including dozens of photos, docs and a score of new illustrations); Your help would be precious for Canadian-built vehicles indeed. Feel free to comment also. Absolutely, I would love to help in any way I can. I have 22 years of experience in the military, 10 of which I was armoured and I have time on Cougars, Grizzlies, Bisons, M113s, TLAVs, Coyotes(Lav 25s) and Leopard C2s. If you ever need any assistance, do not hesitate to ask. I have a soft spot for carriers as I am part of the lucky group of owners, my carrier is a 1942 MK 1* Mortar Carrier. What a career indeed ! You’re more than welcome given your expertise. As you know perhaps our partnership with the Ottawa museum, we will strive to present all Canadian military hardware past and present straight in the coming weeks. Feel free also to join our forum (http://www.tanks-encyclopedia.com/Forum/) and meet the team. Thanks for these words too, always a team’s morale booster when we see the work ahead. SOMM – Southern Ontario Military Muster Feel free to contact us on Facebook for pictures of Windsor built Fords. Hey just wanted to point out that the american t-16 version had a fourth wheel, so the picture is off. Never knew that there was a variant with a boys at rifle in it. It wouldn’t be that effective seeing as the thing couldn’t pen. that much armor, i guess ambushing some halftracks could work. Is There A Chance You Will Do An Article On the Loyd Carrier ? The UE post is fairly old (one of the oldest) and has been rescheduled for a complete rewrite and overhaul with gazillon of new illus and photos. I am writing a book. Part of it concerns stealing fuel from a Bren Gun carrier (I am calling it that because the bit that concerns me is 1940). I am stuck, because the theft is via a length of rubber hose syphoning into a four gallon can from the BGC; but I am uncertain as to the location of a carrier’s fuel cap/pipe. I recently talked to the Tank Museum in England about the color. He told me that many of the T16’s produced in the US were painted OD. But also stated that there was no definitive color as when they reached Europe many were painted with whatever they had.